This big, shiny BBQ grill comes loaded with lots of cool features. While a little low powered for its size, the U-type burners give even heating. The infrared side burner lets you heat a pot of sauce or sear a steak and the rotisserie burner gives you worry free rotisserie cooking though you have to pay extra (about $80CAD) for the rotisserie kit to actually use it. The problem with this gas grill, like many similar products, is that quality is not an included feature. Metals are thin, easily dented or bent and of a lower grade of stainless which means rusting, discoloration, and staining. This grill is not built or designed by Cuisinart. Cuisinart, once synonymous with quality kitchen appliances, has allowed its name to be stamped on this gas grill. Previous be being branded Cuisinart this grill carried the Canadian Tire Store brand name Centro. Centro BBQs did not have a very good reputation (see the over 350 comments on this entry on Centro BBQs) so the name was changed. The importer and manufacturer, however, stayed the same and even Canadian Tire has had to address the fact that the grills look the same, admitting, that yes, they are the same. The Cuisinart Infrared Gourmet is the largest and most expensive of the Canadian Tire exclusive Cuisinart grills. It boasts a large cooking area, an infrared side burner, and an infrared rotisserie burner (though you have to buy the rotisserie kit separately to use it). This grill is shiny and pretty on the showroom floor and bound to sell well even at this price (around $650CAD). This is too bad. You would be better served with a more basic grill and one that had no or little stainless steel. In this price range, stainless steel is the lower grade stuff that holds onto a magnet. This type of stainless steel discolors, stains, and rusts. However, this isn't what's going to make you drag this grill to the curb in a couple of years. The quality of the exterior is the same as the quality of the interior. Inferior burners and internal components can cause this grill to corrode from the inside. This means that the grill will fail to cook well as these parts break apart. The one feature I do like about this grill is the design of the 3-burner system. 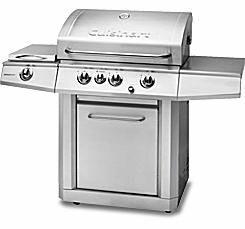 This is a large grill and in similarly large gas grills you will typically find as many as five burners. This grill used U-type burners that basically turn it into a 6-burner grill without adding all the extra parts to support that many burners. Three control valves give you three zones of heating which is certainly enough. All in all, I would not recommend this grill. It will work fine out of the box but it simply doesn't have the lifespan to justify the investment.